One of the Chakras - Energy Centers being activated at this time, is located above our well known Heart Center. About 2 years ago, I ‘unexpectedly’ felt a massive warmth in my upper chest. A warmth and intense bigness, fullness...I’m not sure how to describe it. At the time it felt uncomfortable. I didn’t know what was happening and almost immediately felt like I needed to go and ground myself. In hindsight, I wasn’t used to being here with my heart fully opened and activated. This is the reason why it felt so uncomfortable to me. Thinking about it, I’ve actually felt this in my childhood - as I once professed Love to everyone in the world, thinking that everyone could hear me. Another time at one of my childhood birthdays, where I was so full of love and appreciation that I grabbed a friend next to me and planted an immense kiss on her cheek. 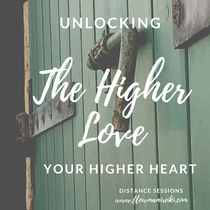 As we’re born into existing programs and patterns of heart closedness, in a world where the majority are existing with our Higher Heart connection closed off, we also learn to close ours. I believe that when we are born, we come fully opened, fully activated - we then begin to close certain parts off. Be it as forms of protection or ways to relate to our surroundings, etc. But our true way of being IS fully activated, all Energy Centers balanced, spinning, vibrating, Flowing as they were meant to be. With enough remembrance, we may get ‘older and wiser’, relearning to love ourselves and our brothers and sisters - remembering that we are All ONE. Some of us remained fully opened and activated throughout our childhood and adult lives. Which may have brought with it certain challenges, that those of us who learned to cope and blend with our surroundings, didn’t have to face. Sensitivity to an outer world which was harsh. Nothing wrong with it. We are no longer here to blame. This is the reason why we decided to come at this present time. As more of us remember, many more around us will be activated to also remember. And it will soon no longer be out of the norm to be here with a heart that is always warm, and overflowing with love. Becoming parents, grandparents, aunts, uncles, godparents, to children and or our animal family, can also help us begin to remember and access our Higher Heart. Our Higher Heart awaits us, between our Heart and Throat Centers. You can lay your hands on your upper chest and start connecting and turning it back on. An immense warming of the Heart. An energizing of the Heart. Feeling such a Love within yourself, that feels like it can’t be contained. A Love that feels its connection to everyone, regardless if they are people you know or not. I’m so grateful that I experienced this in my childhood. From that experience, I realized that that state of being is my goal. The last few years, some would call them the ‘dark night of the Soul’, began my conscious decision of letting my Higher Heart feel again. Little by little, as bits and pieces of past experiences, challenges, programs, beliefs, traumas, codes, etc. (what you’d like to call them), are transformed - there is then more space and opportunity to open her back up.